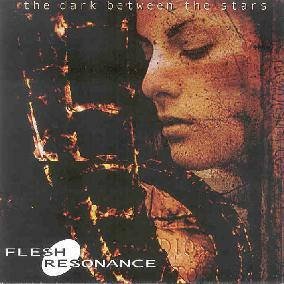 Flesh-Resonance - "The Dark Between The Stars"
This is a music project from two members of the UK Death Metal band Morbid Symphony, with Andy Morris on synthesizer and Melanie on vocals. It is described as Dark Ambient electro-rock. The CD opens with a dark ambient track. "Futures Past" is a almost techno like at times and has a ripping guitar solo! "Behind The Sun" begins with programmed orchestration and it really builds and the band layers on voices, guitars and effects, but always comes back to the machine like rhythm. Quite a cool track. There are some tracks that are just dark ambient soundscapes. There are some really cool female vocals on a few tracks. The CD is really a mixture of many styles of things. The industrial Skinny Puppy style stuff to the sampled electro stuff to the ones with some heavy guitar and female vocals. There are no real drums so I would be hard pressed to call any of it rock music but some of it is heavy and dark ambient which is probably the best way to describe this stuff. It is great to see musicans from Death Metal expanding out into such a experimental area of music. Hear sound files at the Flesh-Resonance Mp3.com web site at: http://www.mp3.com/fr.